Like any other day, our lunch gang started walking from our cubicles towards the cafeteria. At the entrance of the cafeteria, the menus available that day had been put up and also a sample dish for each menu had been placed on a table. Even though my choice remains same - "South Indian Full meals" - everyday, I have made it a habit to skim through the other choices just to know how miserable people's lives were going to be that afternoon. If you didnt already know, my metabolism has developed a disliking for most vegetarian proteins (like dhal, peas, soya chunk) and hence I go for the menu that carries the least veg protein content. That being my criteria, Vinodh has another interesting habit. Merely looking at the sample doesnt give him a satisfactory idea about what is being served; he touches and feels the food to make a choice. Once he made an amazing observation that the potato curry which was part of the south indian meal did not have salt, just by touching it. He could not categorically answer when I asked him if he had taste buds in his fingers since birth or if he had recently developed them. I thought it was an interesting case of evolution. He was becoming the fittest to survive our canteen food. After each of us made our choice, we stood in the cash counter queue to get the token. Sindu took out a 500 rupee note (a.k.a bill) and gave it to the counter guy. He looked at the note on both sides and said he cant take it because it was a fake note and asked for a different one. Sindu took out another one and he rejected that too. Then Gopi made the payment and got us the tokens. Gopi who was listening to me while I made the above analysis, took the cue from me and re-confirmed my observation. He also added that Subba Rao was infact a Cricket Umpire. Of course all of the above were made up by us, just to make fun of her...but she thought we were telling the truth and got totally tensed. She said her house owner had given her 25000 in 500 rupee notes and the two that were rejected at the counter were from among the fifty 500 rupee notes that she took from the owner. After our destinies for the day were served on plate, we assembled at the big table that Ranjani had reserved for us by placing her lunch box on the table as is the custom. Our discussion slowly turned towards ATM machines. I started telling how different banks used different types of ATM machines and sometimes, the same bank in the same place had two machines that worked differently. In most machines, you insert your card, enter the pin, press enter, choose the type of account, choose the type of transaction, key the amount, confirm it and decide whether you want a receipt or not and then money comes out and then the card. When ATMs were still new to me(some 6 years back), I inserted my card and waited for the machine to prompt the next question. The machine just held the card it its mouth and didnt say a word on the screen. I thought the machine must have had constipation. After waiting for a few minutes, I pulled the card out. Now it asked me "Please enter the PIN". I learnt the concept of "swiping". Well, that's the second type. You just dont insert the card, you swipe it. Then there are ATMs in which you enter the PIN, but on pressing the "enter" button, nothing happens - because, this is a touch screen and so, the "enter" should be pressed in the screen. In some machines, you habitually enter "1000" without looking at the screen and to your dismay the machine shows "10.00". I once tried "1000.50" and machine asked me to enter the amount in multiples of 100. I left a note in the suggestion box saying "Please have your programmer, declare the amount field as an integer instead of float. He is wasting some memory space there". Some machines, while you eagerly look at the "money slot", expel the card first and then the cash. And while doing that some machines, keep making a warning noise as if to give you a compulsive head ache, until the card is pulled out. In fact, one machine continued to make the noise until I kept the card back in my purse. But, the reason why I felt ATM machines were nothing but "Atrocious Teller Machines" was because - once - the machine asked me to insert the card, then the pin, then the type of account, then the amount, then asked me to verify it, then it asked me if I wanted a receipt, then it asked me if I had taken break-fast and after doing some fuzzy logic with all the input I gave, declared "This transaction cannot be processed". And another machine would not even accept my card. It kept spitting my card out as if I had fed it with bitter-guard. Then I realized it accepted only Master Card and not VISA. Now, Gopi remembered an incident when, he got frustrated waiting for the security guard to stop flirting with the group of girls and leave way for him to enter the ATM. So, as soon as they came out, he rushed in and fed the ATM with his card and the machine simply gulped it. When he came out with a shock and explained to the security guard, he told him that the same had happened to the group of girls. Gopi did not ask why the guard did not stop him. Now Ranjani remembered an occassion when, the ATM after asking the hazaar questions as usual, even made notions of counting the money (the noise that it makes before sending out the cash) and then said that there was no money. She asked why the ATM would want to cheat like that. Gopi clarified that he too thought the noise was made when the ATM counts the cash, but realized that it was not true when he just wanted Rs. 100. The ATM still made the noise to give out just one currency note. It occurred to me that the ATM doesnot probably count what it sends out, rather the balance amount that stays within. Ranjani felt may be it scans through all the notes and finds the oldest and the shabbiest looking note to give out. I said, may be it tries to locate fake notes and sends them out first. My last point, brought Sindu back to this world, and she asked if even ATM machines could have fake notes. I said on a bad day, even RBI could release fake notes. Later that week, Sindu went to meet her house owner with the 25000 that she got from her. The house owner is a bank employee and incidentally a lawyer. She confirmed that the notes were not fake. After reading it, I realised that knowing how to identify fake notes is important not only for my own good, but is also a duty as a true citizen. It is important to retain the ATM transaction receipt at least for a week or a month depending on the amount. The Innovation Stall - "In ovation to Innovation"
The following is a true story. Names of characters have been changed just for the heck of it. Not sure how many of you would find this entertaining..anyways I just wanted to write about something that was part of my life for almost 20 days. Joy is the head of the Innovation Group of Wisdom Ltd where I work. 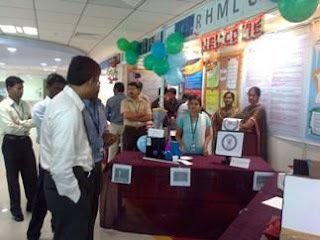 Innovation being a part of our growth strategy, he decided to conduct an innovation fair across the organization for all business units that partly or fully operated from Coimbatore. He formed the iBrigade team and entrusted them with the responsibility of conducting the fair. Pradaap is an Assistant Project Manager in the RHMLCG business unit. He was chosen as the point of contact for the Wisdom Innovation Fair ("WIF" in short) activities for the RHMLCG unit. In the look out for volunteers, Pradaap sent out an email to all the RHMLCG managers in Coimbatore. In his distribution list, I was the odd man out. I am not a manager, but I happened to be in his distribution list because I was the point of contact for my project in Coimbatore. 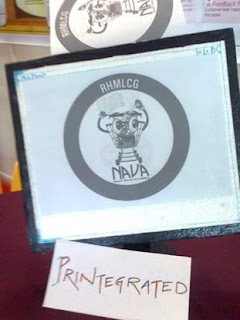 Along with the volunteers list, we were also asked to come up with a mascot for our business unit. Myself and my teammate Soumya discussed over lunch that our mascot should not be an animal. We imagined some animated object like a truck or phone or toy that represented our business unit("BU" in short). We finally sketched an animated 'Trolley'. Eventually, that was the one voted by our colleagues. Next, Pradaap invited us for a short meeting to decide the name of the mascot. All names suggested had an "i" in front of them (like - icarte, itrolley, iwheel). I put it plainly that adding an "i" in front of everyword doesnt make it innovative. Pradaap prompted me to come up with a name that did not start with "i", but was connected to "ideas/innovation" or had some relevance to our BU. I suggested "Nava" ("New" in Sanskrit). At the end of the meeting, I asked about the innovation stalls to be put up at the end of the month, specifically asking about any data needed from my project (anticipating that I may need 2 or 3 weeks to get the data). Pradaap said he would keep me in loop. He called me two days later asking me if I was willing to be a part of the innovation stall ("istall" in short) team for my BU. I had recently learnt the art of telling a "pleasing no" and tried it on him. "Pradaap, I would love to be a part of the team, but I am busy with project initiatives which may not allow me enough time". After all, Pradaap was senior to me and he had obviously learnt the art of "countering a pleasing no". He said that he liked my mascot ideas greatly and would like to have me in the team. My part would be to just give some ideas and that there would be a team that would execute the plans. Now, that was an easy bait for an ego-centric person like me and I agreed. He then sent out an email to Kanmani that I would leadthe innovation stall team. Though I was taken aback by the word 'lead'...my inner-self felt happy about it. At that point in time, I had no clue about how I was going to manage the istall in addition to my already mounting responsibilities. We had a tele-conference the next day about the istall, after which Pradaap had to be on leave unexpectedly. Kanmani is another Assistant Project Manager in our BU. She took charge of the istall and called the istall team for a brain storming session. We came up with some high level ideas for the istall. Two days later, Kanmani got busy with a project proposal and she handed over her responsibility to Senthamil. Senthamil is yet another Assitant Project Manager in our BU. When he joined our group, we had already made some plans. Senthamil got us into the act. He is the one who took us from the planning phase to the execution phase. 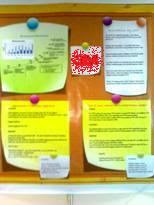 He identified organization recommended vendors who could help decorate our stall and procure gifts for the participants. Saththi is a vibrant youngster from our BU. When Kanmani called for the brainstorming session, it was Saththi who hosted it. He gave us chits of paper in which we had to write down our ideas. He then broke us into two groups and asked us to come up with the top ideas from the list. He then asked one from each group to present the ideas classifying them into four quadrants (High Impact& Most Feasible, Low Impact& Most Feasible, High Impact& Less Feasible, Low Impact& Least Feasible). I presented the ideas of my group. Diya presented for the other group. 4. We would have something for all types of people like - "I want supporting data", "What is RHMLCG", "Di, there is no fun in this stall di", "What games do you have?" Saththi searched the net and found a cool looking design for our stall. We had to drop that design though - the reason - has been discussed later in this post. Saththi also came up with a card game about which we will see at the end. "Saththi, how big is the space going to be?" "It is the distance between two pillars in the cafeteria of KKK"
"Bhupesh, you are the one in KKK. How big is the distance between 2 pillars?" "30 feet probably. But are they going to give us 30feet X 30 feet?" "This is Saththi. I guess, it will be 30 X 6, but I am not sure"
"This is Diya. Let us assume we will get 30 X 6..however, Bhupesh, can you confirm with Joy? "ok, let us move on to the design. I have an idea. Shall we design our entrance like a bulb"
"Bhupesh here...I think that's a good idea. Which side do you propose our entrance to be?" "On this side...Bhupesh..sorry, I have drawn a picture here and showing people the side on which we will have the bulb"
"ok just tell me if it is the 30feet side or the 6 feet side?" "This is Sami. It is the 6 feet side"
"Ok, does the bulb stand or lie down?..this is Bhupesh again"
"Did I say something funny?" "Hey, no...the picture I drew here looks funny..sorry"
"This is Sami....should we have this filament?" "We have a filament in the picture"
"Oh..okay..guys, I really find it hard to understand this. If you guys are okay with the design, let us freeze it and move to things like data collection and what else we will exhibit"
For the next call, when the team in HHK was eagerly looking at the phone for me to join from KKK, I said hello, at the door of the meeting room at HHK. "Hi..I thought it would be effective if I came here in person atleast until we get into execution phase". 1. The innovation data we were collecting from the different projects would be printed in a flex print which would decorate our istall walls. As part of the data collection, we asked each project to give one of their implemented ideas in the form of a story. Sami and Lakshmish were given charge of the games and gifts. They worked with a 'just out of college' group and came up with fresh and interesting games. Sami Nivas didnt feature in our first few meetings. He joined our group when we were just about to get into execution. He turned out to be "the one". On a saturday morning, myself and Sami set out in search of a vendor who could create the models in thermocol for us. Sami took me to the flower market. We started with a shop that said "marriage designers". We told them what we were looking for. The shop attendant's hand extended in the direction of the interiors of the market. We followed the direction shown by the 7 or 8 pairs of hands that we consulted and reached "Poonguyil Decorators". After explaining them our models with graphs, arrow marks and dimensions, they quoted a four figure number. I reiterated that the models were to be in thermocol. The shop-keeper reiterated that any other material would make it a 5 figure number. Sami and me exchanged a look and felt it would have been good to know a mantra that could have made us disappear the same moment. We got the business card and left the shop hoping not to visit again. In my very first call with Mr. Sudharshan, I realized that we were getting into some high budget stuff...for he asked me to meet him at Kodissia. Kodissia is like the Nehru stadium of Chennai. Nevertheless, we wanted to see what it takes. I and Sami Nivas, were in Kodissia at the said time. We explained our idea to Mr. Sudharshan. He said that it would take 3.5 lakhs. So, we removed most of our specifications and asked him the revised budget. It came down to 1.5 lakhs. We explained him that all this drama was for a 2 to 3 hours fair and not worth that much money. He sensed that though we came from a big banner, we were not Shankars and were in fact Vikramans. He asked us the budget. We told him a 5 figure number. He said he could rent us a few good looking tables at the best. I called Senthamil immediately and told him that we are scrapping the interior decoration idea. He too agreed that we must be spending on the content and not the looks. Now that the money set aside for the interior decoration was available, myself and Sami thought we could spend more on the electronic models - Ergonomics chair and Wonder Paint. We went to a place that did final year projects. "Ma'm, I work for Wisdom Ltd. I need help with creating an electronics model"
"Consu...did you mean which department in college?" "yes..which department - ECE or EEE?" "No, I am not a student"
"No..I WORK for a company named Wisdom Ltd"
"Ok sir..you can meet Mr.Raamaa"
Mr. Raamaa was incidentally the director of the institute. We explained the model to him. The chair model would have sensors that would detect if some object was placed on the chair, but the back and neck of the object (a toy probably) was not erect and if the arms (of the toy) were not on the arms of the chair. 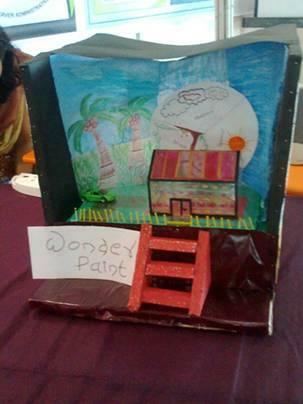 The Wonder paint model would have 3 LEDs inside a mini-house. There would be a wheel behind the house divided into 3 segments. One for winter, one for summer and the other for autumn. Depending on which segment was on top (visible behind the house), the color of the LED would change giving the effect of a paint color change. He quoted 7K. At this point, the thermocol models werent of any hope, the interior decoration had already proved too expensive and hence dropped. I didn't have lot of time to try other vendors who might quote lesser than 7K. I agreed half-heartedly. Delivery was expected 2 days later. "Please register these as 2 projects with the lady over there"
"Ok sir..thank you. Sir, we wont have time to be physical present here when the "project" is being done..please make sure it comes out well"
"Ma'm, I want to register 2 projects that I just discussed with Mr.Raamaa"
"No, I am not from a college. I work for Wisdom Ltd and..."
"No, name of the project"
"Ergonomics chair..E R G O N O M I C S"
"It is the science of sitting in a healthy posture"
"No, I am a...yes, something to do with physiotherapy"
to myself: "(I dont like any of it)"
"Please pay an advance at the finance section"
"Ma'm..I just registered two projects..can I pay the advance here?" "...I am not a student. I am not a staff. The project's name is E R G O N.."
"How much are you paying?" "How much can I pay?" "No, I meant "minimum". Ok, I will pay 3500"
Finally, I came out with the satisfaction of having at least one item done. I called Senthamil and gave him the updates. He asked me about the thermocol model. I said, I was planning to do them myself rather than paying what the vendor asked for. On the way back to room, I bought 2 thermocol sheets, scale, pencil, knife, fevicol. From the very beginning we all knew that the last 2 days before the event were going to be the ones when we would have time and urge to get things done. And the days arrived. Even in school and college days, I always stayed away from theromocol sheets and any decoration work in general. I decided to try my hands at it now - I had to. I started cutting out the sheets for the design given to me by Diya. To my surprise, the pieces came out well. But, when I created a mock assemble of the pieces, they didnt look all that great. I thought to myself that the only hope we had to present something worthy were the electronic models. Sami came to pick me after 2 hours. I showed him what I had made out of the theromcol sheets and he didnt seem satisfied. Anyways, we went to the final year project place. "Ma'm, our project is due for delivery today"
"Batch number CEA274 and CEA275"
"..I am not a student. Can you search for E R G O N...?" "Got it. Please go to 3rd floor to see the demo for 274"
I went alone, leaving Sami in the first floor. When I went there, I was in for a shock. The chair looked like an execution chair. In the positions where we had imagined sensors, there were big telephone buttons. They were all connected through lot of wires that lead to a mini transformer that would take in a 230V supply. I realized my mistake. I had not told them that the model was to work on battery. But it was too late to make changes. I was ready to compromise and went down to pick up 275. Sami joined me. What we saw, gave us a bigger shock. The 'Wonder paint' had been designed in such a way that when we chose the color of the LED to glow, the wheel rotated and changed seasons. What this meant was - as you change the paint of the house, the seasons would change. This was not "Wonder Paint"..this was "Supernatural Paint". In fact, not event that...because, the LEDs had been placed outside of the house...so, it didnt even give the appearance of the house's paint changing. When I was thinking of compromising ways of presenting this in 2 days, Sami wanted this to be redesigned. But, both of us couldn't stay around longer. Sabesh needed help at the flex print place. Also, the unfinished thermocol models with me had to be passed on to Reema so that she could make a better model out of it. And most importantly, I had to leave that evening to Trichy for my cousin's marriage and was not available next day. Sami dropped me at the flexprint place and went back to take care of the electronic models. On the way, he dropped my thermocol pieces at Reema's. 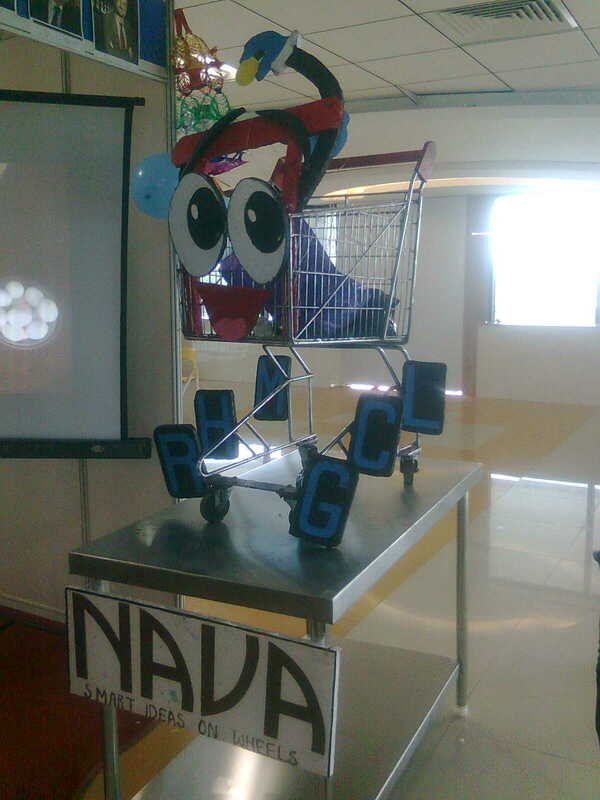 In the meanwhile Reema had rented a trolley from near her house and started working on giving it the appearance of our mascot. While we were busy with the models, Sabesh had started working on designing the flex prints. He had been given the finalized data for the flex prints, just the day before. After introducing myself to Sabesh, we started looking at what he and Saththi had done so far. Importantly, Sabesh had to catch a train in 1 hour and Saththi was busy purchasing for his travel to onsite the following week. What Sabesh showed was absolutely artistic. The background he had chosen for each project was very creative and vibrant. Unfortunately, it had taken him 2 sleepless nights to design for just 3 projects. We had to finish 4 more - in 3 more hours - the flexprint place closed at 9 and Sunday was a holiday - the designer had to be at the mosque for 1 hour in between. It was a difficult equation to balance. Sabesh handed over the work half heartedly to me. During the 'mosque' break, I went once more to have a look at the paint model. It was almost done. Sami was motivating the chip programmer by explaining him the impact of the product he was developing. It was a nice sight to watch him treating the outside vendor like someone who was in our own team. It was getting late for all of us. Since the model was almost done, we said we would take delivery next day and returned to the flex print. We did whatever design we could do in the next 2 hours and gave the flex for print. We felt a relief when it came out well. I though to myself that the flex print was going to be our face-saver. When Sami dropped me in my room, it was 11pm - On time for me to board a bus and reach Trichy in time for my cousin's marriage on Sunday morning. On the day before the event, I was in a small town near Trichy. While I was engaging the guests at the marriage...I kept thinking about how far we had reached in our preparation for next day and what else was left to be done. It seemed like nothing had been completed. At the same time, I should say I wasn't much worried about the preparations either, because, things were in the dependable hands of Sami Nivas and Diya (who had returned to Coimbatore on Sunday after attending a marriage on Saturday). Myself, Sami and Diya were in constant touch through phone calls regarding the status of different things. Sami Nivas was to collect the trolley and other models from Reema's place and bring them to office through a minidor...while I was to bring the 'Ergonomics chair' model which was stuck with me. The chair model still needed lot of decoration to hide the wires, the buttons and the big circuit connected to it. I had asked my team mates Bindu, Pragadeesh, Sumesh and Mani to come early in the morning to help. When I reached the gates of the office at 6.45 in the morning in a call taxi, I was denied entry. I was carrying electronic items which were not permitted inside the special economic zone where there was restiction on imports and exports. I was asked to enter through another gate where there were officials who could grant permission. When I reached at the other gate, I was asked to write a letter. When I took out my notepad which had ruled papers...I was asked to use unruled sheets. This was getting on my nerves, when the watchmen got me two unruled sheets. The readers should consider that I have been in IT industry for six years now and emails typically started with a "Hi" and ended with a "Thanks and Regards". I hadn't used, "To", "From", "Subject", "Date", "Dear Sir" etc., for a very long time. So, preparing the letter wasn't easy. The watchman, again, gave me a 'you uneducated fellow' look and gave me a sample letter. When this formality was done, I was allowed inside. Everyone was waiting for me. Our stall looked absolutely empty, while all other stalls had been decorated. We had 2 hours left for the start of the event. We had a lot to be done. But we had our team - everyone whom we had expected to be present was there - Saththi, Sabesh, Supriya, Suparna, Sami Nivas, Sami Panneerselvam, Lakshmish, GP, Pragadeesh, Bindu, Soumya, Sumesh and Mani. Additionally, Kanmani and Senthamil were there to guide. Diya showed me the mascot model and the other models they had completed. They all looked marvellous and totally professional from how they looked the previous day. We listed out what had to be done. I assigned responsibility to each person/group. While some people got busy with getting the flex print on the wall, some got busy setting the games stall. Some started decorating with the balloons and color papers and some set up the projector. Bindu started beautifying the ergonomics chair. Diya wanted names for the models. 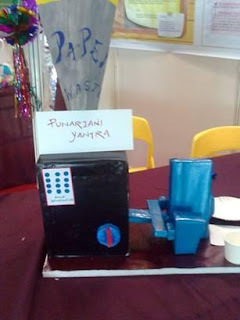 She named the recycling model as "Punarjani Yantra" and the paint model retained it's original name "Wonder paint". 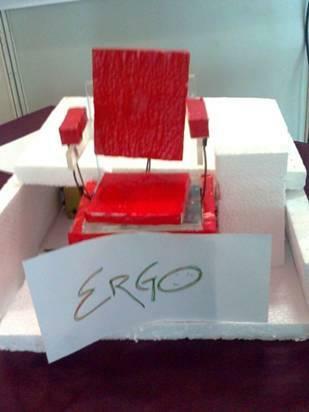 The other two were named "Printegrated" and "Ergo". In the meanwhile, Kanmani went around to take a look at the other stalls. She came back and said that no one had focussed so much on innovation like we had done. She said that should be our unique selling point. She asked me to talk to the team and explain the same. At 9.30, everything was ready. I called out to everyone to assemble and get ready. I briefed the team that our focus would be on innovation. When we present our innovation data, the innovation models and games, we would describe how the ideas for the stall were diverse, were original and were gathered through proliferation. We would also stress that the idea for the models of products that might be in the market in future had come from our own employees. Finally, we would also show case our mascot which was a true symbol of innovation in terms of - not going for an animal - choosing something relevant to the industry - the beautiful and imaginative way it had been created at a low-cost. I rehearsed a mini presentation speech for myself to explain our ideas at a high level to all the visitors. When the CIO walked to our stall, he showed interest in everything we had put up for demonstration. He keenly listened to everything we had to say. He played every game. And what impressed him most was Saththi's card game which was, in a way, a gamble - the profits going to our social activities group "Outreach". He called it an innovative way to collect funds. Then we had the visitors. While one group explained the models, one group explained the innovation data, while another group entertained the game-freaks. Many people stopped by just to watch the vidoes we were playing. All this while, our mascot stood there with a happy and courteous smile. We won the second place. When we got down from the dias after collecting the certificate and gift, Pradaap was there to congratulate us. There have been many enquiries about my physical well being. Hopefully there will be none about my mental well being after this post. I have lots of options as excuse for the long absence. Let us stick to laziness. To the interested minds, here is what has happened of bhupesh, to bhupesh and to the nears and dears since July 2010. Firstly, my room mate left to the US and became a Non Returning Indian again. Which meant, I was 'Home Alone'(at least I belived so - more to follow on this). Secondly, I have a lot of additions to my tag cloud. I use these words everyday and with shameless pride, as if I am the management messiah that the world has been waiting for. Some of them are: SoW, FTE, CR, C2.0, blended rate, NC, SPP, fishbone, pareto, pipeline, utilization, value add, goal setting, quadrant, bandwidth. Just to illustrate the effect, my team starts playing bingo as soon as I pick the phone. I started using the meeting room to avoid it, but I very recently heard someone shout 'Bingo' on the other side of the phone. Jokes apart, I feel like I am evolving. Next, in the absence of a project manager in Coimbatore, I get to represent my vertical(for non-softwares, this is equivalent to "department") in meetings where "High Tea" is served. This means, I get to rub shoulders with some really tall people, like my Vice President who was 4 inches taller than me when I last stood near him (in the meeting before that, he was just 3 inches taller...in Cognizant, you "really" grow). Also, I get to try my jargons, amidst the smart minds of Cognizant. One such meeting was a workshop about improving the entry level training curriculum. Well, the show-off is only in office. I had been to my cousin's marriage two weeks back. For the most part, I was seated next to my younger sister and brother-in-law. I experienced the utmost injustice that has been dealt to me in a very long time. People walked to our row and with all dignity wished my sister and brother-in-law. They didnt seem to consider my existence. It is amazing how one becomes 'respected' after marriage. There was one person who did consider me and wished me, only to take 50 rupees from me. Earlier, my sister and BIL, visited home for the first time after marriage and we had a nice time - in between coffees. (My BIL likes coffee and that was reason enough for my mom to keep preparing coffee that the entire street didnt sleep because of the smell from our kitchen). My BIL talks less like me and considering the fact that he is putting up with my sister, he must be smarter. I have been reading some books: "The 7 habits of highly effective men", "Alai Osai", "Romance in Chaos", "Nothing can be as crazy". First and second book are popular anyways..the remaining 2 are avoidable. Lastly, the month of August was amazing. One reason, Coimbatore has cooled down. The other reason is that innovation was in air. Cognizant celebrated a month long innovation fair. Many events like art from waste, rangoli, quiz were conducted. The cross-word was won by yours truly. The treasure hunt event was amazing...especially because I was able to run ahead of many other younger chaps. The crux of the events was the innovation stall, which I was lucky to coordinate for my business unit and won the second place. More than the prize, it gave me the chance to interact with some lovely people. If not for anything else, I should consider myself lucky for the kind of friends I keep meeting. The innovation fair, opened doors to two gems as friends. For the amount of time I spent on the Innovation stall, I should be writing a seperate post on it....especially the misadventures. Part of the innovation fair was the "Innovation Evangelist" program which I attended without knowing what I was getting into. It turned out to be an organization level initiative of which I am a part now - gladly. So, what exactly am I doing, "Awakening the Innovator"...and also my room mate now..so, let me wrap up.